Can someone who doesn’t like people find love? 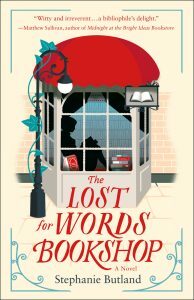 (York, England 2016; 2013 and 1999 backstories): “I don’t love much, but I love words,” says Loveday Cardew, the central character in The Lost for Words Bookshop. Loveday. What a cynical name for an antisocial character who has sequestered herself in a used bookshop in northeast England, working there for the past ten years. The charming British bookshop on the cover of Stephanie Butland’s latest novel is “full of stories that are, potentially, at least as painful as yours,” Loveday signals in her diary-like voice. Since she’s lost for words around people, we pay attention to the clues she offers. These reveal why a twenty-five-old woman is excruciatingly cautious of and withdrawn from people. Something or someone has hurt her badly. So don’t be fooled by her snarky prose. I found myself tearing up five times. Loveday wants us to believe she’s unlovable reflecting how she perceives herself: a “sulky, emo-goth” who’s “incapable of sensible human interaction.” Once we start piecing together the roots of her anger, distrust, and forlornness, she’s still not warm and fuzzy but our hearts go out to her and wonder how we’d have turned out. In fact, she dares us to do just that: “Do I sound jaded? Well, let’s swap places and see how you do.” Thank goodness we don’t have to in the real world. There is one person Loveday does like: Archie, her colorful, avuncular boss and “only real friend,” the softest, most generous soul. Everyone needs an Archie in their life, who does so much for you without your even knowing it. Lovable to the core. Archie cares deeply about Loveday, but she’s too broken to fully appreciate he does until her tightly controlled world unravels. Loveday’s sustenance for books literally goes skin deep. Her prickly skin is inked with tattoos marking favorite lines of adult and children’s books that contain secret meanings. Naturally, Loveday is not at all pleased when she discovers a book on the ground near a trash bin. A book of poems. “Poetry has a difficult enough time without people throwing it away,” she grumbles, taking it personally since she writes poems secluded in her bedsit – one of many British words, references, slang you’ll encounter. That term you know, others you’ll guess at, some maybe google. Like I did about the poetry book Loveday found: Grinning Jack. Written by Brian Patten, one of three influential Liverpool poets from the sixties who put performance poetry – the spoken word movement – on the UK literary map. Poetry is making a comeback – both written words and spoken words performed for an audience. So the poetry book is part of a poetry storyline. The gist of the poetry plotline: Loveday posts a note on the bookshop’s window hoping a passerby will claim the book. A week later someone even Archie doesn’t know walks in to reclaim it. Archie warns him Loveday “doesn’t approve of people who aren’t good to books.” Nathan Avebury, put together too well for Loveday’s taste – a leather-coat and “metallic-blue” ankle boots – is undeterred. Strike two: he’s confident, though secretly she wishes she was. The “beautiful, ramshackle, home-away-from home” bookshop has an old-fashioned letterbox drop. After Nathan left, Loveday spots a notice sliding out of it about a Wednesday night poetry slam at the George and Dragon, a two-hundred-year-old community pub in the Yorkshire Dales countryside. The invite was meant for Loveday. For someone who doesn’t give people a chance, who recognizes “getting to know me is an exercise in faith rewarded,” venturing out to the poetry event is a huge deal. Initially put off by Nathan, Loveday starts to warm up with him, observing “his eyes were the kind of blue you find on self-help covers, to suggest clarity and calm.” Yes, a romance is brewing but in a novel of twists and turns things don’t go smoothly. Nathan earns his living as a magician. Magic is certainly needed to reach Loveday. A second plotline explains Nathan’s challenges: Loveday, who assesses every book donation, mentally registers but doesn’t think much of at first three boxes anonymously dropped off one by one. Since she’s always on guard, she becomes suspicious and then unglued when there’s too many coincidences in the boxes tied to her childhood. Who must know about her past? A past revealed over many chapters and two timelines, while the mystery donor is not unveiled until the end. Chapters are cleverly named and sorted by literary genre. Nathan’s 2016 present is found in the Poetry sections. History chapters, set three years earlier, center around an ex-boyfriend, presumably her only one, a relationship that devolved into a bad, haunting experience. Crime chapters take place during her childhood. These make clear how Loveday came to be the way she is. Once she was a happy, adjusted girl with fond memories of books and living along the North Yorkshire Heritage Coast in Whitby. At a poetry performance, Nathan tells Loveday “my sister’s beautiful too.” Of course, she’s stunned he said too. She’s not someone who looks people in the eye, but with Nathan she can’t help it. “I don’t gaze,” but that’s exactly what she can’t stop doing. Still, if she’ll ever break out of her hardened shell, Nathan will need much fortitude, sensitivity, and love. Nathan is the other character we should all have in our corner. Poems meant for performance and insight are sprinkled throughout. The poem Loveday watched Nathan perform when she bravely walked into his poetry world ended with: “Next time you leave something behind, you might have just begun a whole new adventure.” Loveday and Nathan do; so will you. Not very surprising, the author describes herself as an “occasional performance poet.” She also trains people in creative thinking, and lives by the north England sea. A terrific combination for a novelist whose created a twisty plot involving printed and spoken words. “Some plot twists,” Loveday says, “you don’t recover from them.” Will Loveday?